Monkey see, monkey do, now your little one can pretend to be like you! 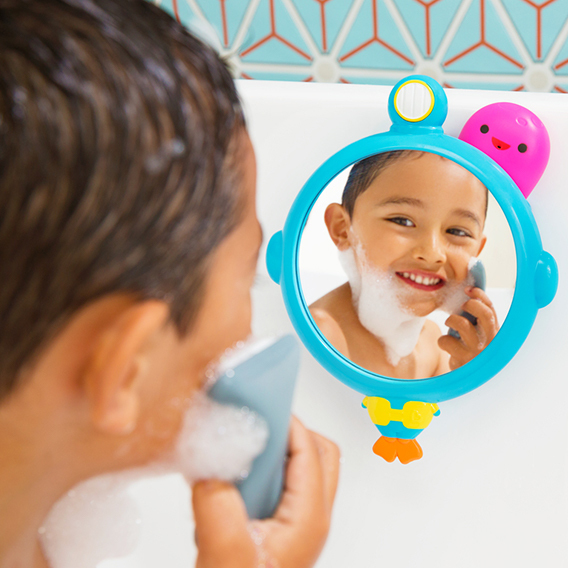 Little ones love to mimic mom and dad, let them in on a little more fun during tub time with the See, Shave & Squirt™ Mirror and Shave Set. The bath-friendly mirror makes for easy interaction & self-discovery - make a cool soap mohawk, a bubble beard, and more. Add to the excitement with the adorable shark with razor-like teeth and squeezable ocotpus squirt! The mirror is made with Clear-Sight™ technology for a vivid reflection with every use. Enjoy a teachable moment filled with laughs while your tot learns hand and eye coordination as well as action and reaction.